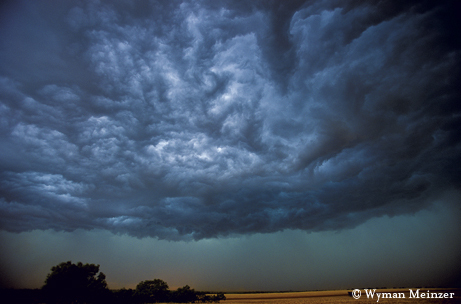 Trained meteorologists and amateurs alike help keep track of that crazy Texas weather. The day might have begun like any other — fresh eggs, dairy cow milk, and a bumpy ride down the dirt bluff road to the beach along the shores of Lake Texoma. Although choppy conditions may have kept the boat off the water, we would have fished anyway, casting our chances from the gravelly shoreline, waiting for the coolness of morning to give way to the heat of the day. By mid-afternoon we would have shed our shoes and gone swimming. But Mother Nature had other plans. That night we slept inside the cabin’s screened porch, a handmade homestead that sat along a rural route stretching north between the oxbow curves of the submerged Red River. The lake air moved gently through the mesh, carrying the scent of cedar berries and striped bass noodling in the riprap. Abruptly and without warning, a funnel cloud descended out of midnight, screaming like a jet engine just above the treetops. The deafening sound sent us scrambling for shelter beneath the cabin’s kitchen table, my sister and I excited, my mother and grandmother terrified. The roar shut down our ears. Then, just as suddenly, stillness. Afterwards, my father and grandfather surveyed the grounds around the cabin for damage but found none in the quiet of the early morning hours. At daybreak they drove the short distance to the local marina and discovered the twister’s brief landing and its dregs: snapped trees, half-submerged docks whirligig against the shoreline, boats tossed about like wooden scrap. Had there been a warning? Unlikely. It was only mid-century in the modern age — no siren; no Weather Channel ticker alert; no streaming weather dotcoms (no Internet at all, in fact); just a television broadcast earlier in the evening. The weather news, teleported out of Ardmore, Oklahoma, suggested evening thunderstorms for the Lake Texoma region. Rabbit ears caught it and channeled the signal into scratchy black-and-white flickers that rolled and skewed, all vacuum tubes and sine waves, the voices buzzy and popping as if transmitted from some distant galaxy in decades past. Technology has bridged a significant gap since then, allowing today’s vast weather data to arrive spontaneously and through a medley of venues. Unfortunately, the volatile weather it monitors has continued to blow in just as rapidly and with its own multifarious discharge. Texas, it appears, receives the brunt of this action. 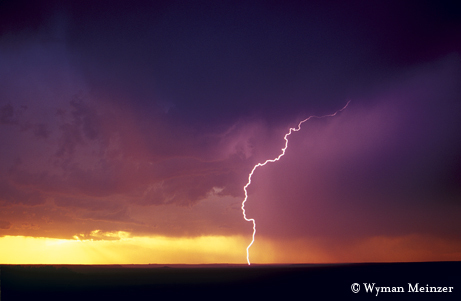 Consider the lists of top 10 weather extremes for the nation. Texas occupies three of the 10 available positions for frequency and severity of hail, one for average number of tornadoes, one for the all-time hottest and driest, two positions for the top 10 windiest, and three for the most humid. That’s a lot of weather to negotiate. The professional weather services and research centers parse out most of the details for us, but multitudes of Texans have also taken our extreme weather variables to heart. Want to know the current weather stats at pinpoint locations in Crowley, Midlothian or Frisco? How about Texline or Muleshoe? 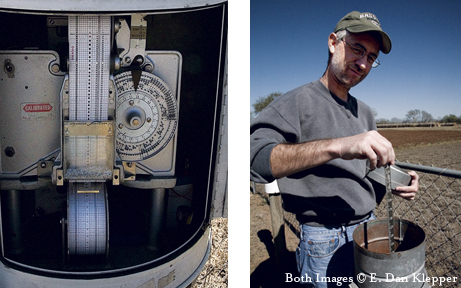 Hundreds of Texans maintain weather stations in their own backyards as members of the Citizen Weather Observer Program. These “citizen scientists” collect weather data and upload it to state and national weather service centers daily. They offer real-time conditions and detailed climate data — in essence, providing weather quality assurance for the state. Texans, however, are not alone in their weather watching endeavors. The entire nation is made up of weather monitoring enthusiasts. According to Chris Davis, senior scientist at the National Center for Atmospheric Research, it seems we may have a good reason to be observant. Davis says that America’s extremes of heat and cold are the result of the country’s vulnerability to the larger continental climate. The lows, in particular, are difficult to avoid. According to Davis, snow and ice storms are likely to occur regardless of where you live in America. To do so, the NWS maintains a large network of official weather data gathering sites to keep its citizens informed. Many of the cooperating stations have been gathering weather data for at least a century, including more than 30 of the hundreds of Cooperative Station Network sites throughout Texas. By 1910, rural outposts and fledgling communities like Alpine, Beeville, Corsicana, Falfurrias, Mexia and Temple had begun archiving the artifacts of weather by hand. The oldest available data for the Beeville 5 NE station, now positioned on the area’s Texas A&M AgriLife Research and Extension Center grounds, dates back to 1906. These early climate inscriptions harbor a scrivener’s legacy of fountain pen strokes. Hand-recorded data cuts across the ledger pages like ink-black sharks. Oddities, such as number of days with “windstorms” and “fogs,” account for pages and pages of 1’s and 0’s, incidentally presaging the digital age. The stations’ instruments, a collection of rudimentary devices designed to read temperature, wind speed and rainfall, occupy a small plot within the larger research location and still operate, with some modifications, today. As climate analysis improved and the application of weather data evolved, some Beeville observations were abandoned. But the basics, such as temperature and precipitation, continue to be recorded by hand (via the keyboard) and, thanks to advanced technology, by automated systems. Technology — specifically, affordable weather gadgetry and the vast reach of the Internet — has, in fact, made weather watchers out of thousands of us. Our rationale for weather watching appears to transcend routine climate monitoring. Comments on one of an infinite number of Internet weather forums reveal a compelling array of emotional and intellectual reasons. Comments like these bring to the forefront a simple truth about our relationship with the planet’s climate. Each day the weather provides fresh challenges for coping with conditions that appear completely out of our control. In fact, a monumental change in the climate seems to be on almost everyone’s mind today. But what does our abundance of available weather data tell us about the changing climate, and what does it portend for Texans and our natural environment? These are difficult and complicated questions to address, but many of our climate scientists are making headway with the answers. One of them is John W. Nielsen-Gammon, Texas State Climatologist, professor of meteorology and acting executive associate dean, College of Geosciences, Texas A&M University. Nielsen-Gammon has reviewed the state’s climate data from the United States Historical Climatology Network, much of it dating back to 1895. According to Nielsen-Gammon, the cool period was deeper in the state than elsewhere over the planet during the latter 20th century, yet the rise in temperatures thereafter has been more rapid in Texas. So what will it be for future Texans? Hotter or colder? Wetter or dryer? Is our change in the weather simply a natural cycle or catalyzed by humans? Plenty of opinions abound. In fact, it seems that every citizen has one. While citizen-scientists across the country continue to record daily conditions, the climatologists move forward with the diligent work, analyzing data, studying climate models and gaining a greater understanding of our changing weather. It is still uncertain what all that science will ultimately tell us. But one thing is for sure. We’ll all be watching.